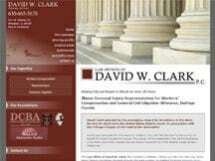 The Law Offices of David W. Clark P.C. is located in Wheaton, Illinois. As a lawyer serving the legal needs of personal injury clients throughout the Chicagoland area, I am dedicated to helping injured people navigate the complex legal issues they face. My personal injury clients are dealing with the effects of motor vehicle collisions, slip-and-falls, dog bites, defective products injuries and other accidents that have caused devastating physical and financial effects. With more than 20 years of experience as a lawyer helping injured people, I have the skill to secure my clients the results they need. I also represent clients in workers' compensation claims for on-the-job and employment-related injuries, including back and neck injuries as well as carpal tunnel syndrome and other repetitive stress injuries. Employment injuries arise from negligent equipment operation, construction accidents and improper safety equipment, among others. My clients are very satisfied with the high quality of legal work and personal representation I provide. Clients have called me caring, compassionate, kind and trustworthy. I have obtained favorable results for past clients, including multimillion-dollar settlements in personal injury and workers' compensation claims. I also maintain a business litigation practice, contract disputes, and collections for small businesses. I am a solution-focused litigator and try to obtain out-of-court resolution as much as possible. In addition to my private practice, I serve on the Board of Administer Justice and work with its Legal Aid clinic. I am licensed to practice in all state and federal courts in Illinois and am admitted to practice before the U.S. Supreme Court. The Law Offices of David W. Clark P.C. serves clients in Chicagoland and the surrounding suburbs, including Naperville, Bloomingdale, Addison and Lombard. My fees for personal injury and workers' compensation claims are on contingency, which means there is no fee until I secure a settlement. My business litigation fees are competitive. Any type of car accident with another motor vehicle can disrupt every area of a person's life. Depending on the severity of the car accident, I know that medical costs and job loss can add to the pain of dealing with any resulting personal injuries. My firm is experienced with handling a wide range of issues associated with personal injury cases, caused by truck accidents. I understand the complex state and federal regulations, under which large trucks must operate. As an attorney with more than 20 years of experience in personal injury law, I can help guide my clients through the emotional and financial strain a wrongful death case can bring. I work extensively with people who have suffered back and neck injuries. As a personal injury and workers' compensation attorney, my goal is to ensure you receive the maximum financial compensation you deserve. Workers' compensation covers a wide-range of employees in Illinois, who have suffered employment-related or on-the-job injuries, regardless of fault. If you have been injured at work, you have the right to obtain certain benefits and compensation.